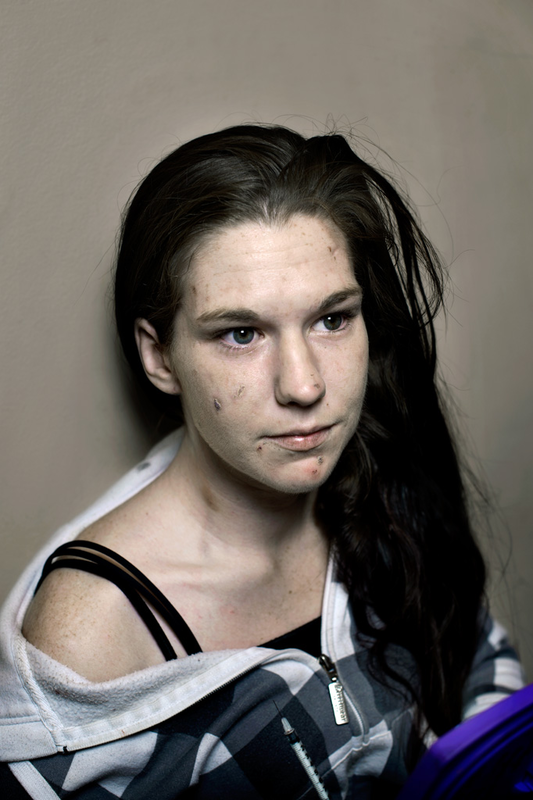 Live Through This is a book created by Canadian photographer Tony Fouhse and young heroin addict Stephanie MacDonald. They met in the street before she got clean – before she wrote this book. LILA: What do you remember of the day you met Steph? TONY: I remember that day very well. I had been shooting on the block for another project, USER, for an hour or so when Steph came up to me and asked what I was doing. I told her and she asked me if I would take her picture. I set it up, shot a few frames and knew right away that there was something about her. She was intense but open, transparent, able to get in touch with her feelings and brave enough to show them to me. We talked for a while once we were done and I just felt some kind of connection. I met and photographed her a number of times over the next month or so and finally blurted out the words “Is there something I can do to help you?”. LILA: …she answered she wanted to get clean and your journey together began. Have you ever thought Steph was not going to live enough to complete Live Through This? TONY: Yes. When Steph left the hospital (3 days after brain surgery, against medical advise) I was told that she had a 50% chance of dying in the first week. Too, about 4 months ago she relapsed (for a while) and called me up from her hospital bed (we live about 1000 miles apart). Because of her renewed drug use her Hepatitis B was acting up and her liver was failing. She straightened out and seems to be doing okay these days. But every day is a struggle and the future is unwritten. My first memorie of being in Ottawa would have to be walking down to King Edward and seeing how easy it was getting the drugs i needed and seeing how many people all had drug problems!! chris new where i could go to find the block so i could get my pills but he was scared to ask anyone. So i went and asked the first person i seen was noddening out and boom i found my fix. i looked at it as a safe place to live and do drugs without going to jail cause i know in halifax if they see you around a drug place you get searched and booked in jail but not here they just see if your alive. LILA: Tony, who is Steph, beyond the word drug addict? TONY: Steph is a bright, sparkly person. She likes to get excited but is also about the laziest person I have ever met. You know how you go through life and meet all these people but only 2 or 3 or 4 of them become real friends? Why is that? Probably has to do with things you can’t really verbalize, don’t even want to. You are just happy to have met someone who you feel real and comfortable with. That’s Steph. Steph, co-author of Live Through This. LILA: I’ve never been to Canada. Ottawa, the capital, is ranked one of the highest quality of living city of the world. Funny enough, your pictures/stories of addicts paint Ottawa like the equivalent of Skid Row, in my imagination. How do you perceive your own city? TONY: Ottawa (or, as I like to call it: Kapital City) is quite parochial with an overhanging odour of bureaucracy. It’s mostly pretty, scenic, even, and safe. But like any tight conglomeration of one million people, it has variety. USER, my photographs of addicts were all shot on one 30 metre strip of sidewalk where this particular society of addicts hangs and conducts business. If you walk 2 block from there you are in a totally bourgeoise, tourist-trap area. Life’s like that. LILA: On your website I saw a few pictures you took here in LA last year. You clearly have a special focus on the people who lives at the margins of society. Have you ever thought of shooting LA addicts who belong to higher social classes? Maybe for another book ;). TONY: Never thought about shooting more addicts. I’m done with drugs.